Obvara is a centuries-old Eastern European method of scalding the surface of a pot to minimize porosity. The process involves preparing a solution of flour, water, yeast and sugar and allowing it to ferment for three days before firing. Bisqued pots fire to a temperature of 1650 degrees using a raku kiln, then plunged into the prepared solution which burns the surface of the pot. The pot is then quickly quenched in a water bath to stop the burn. 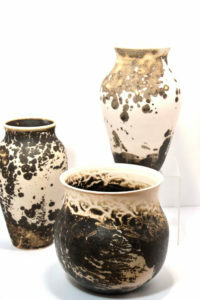 The results are unpredictable, each vessel having its unique character and beauty. Obvara vessels are for decorative purposes only. Welcome to Martha Dempsey local potter creating Obvera pottery here in North East Ohio visit the gallery to see more of Martha’s work.